Where to now for the refugee campaign? There are enormous challenges ahead for the refugee campaign. 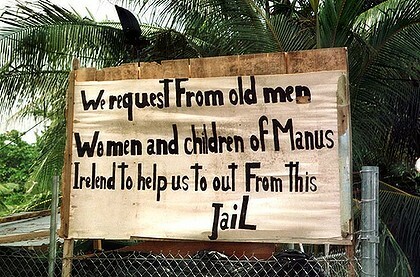 In the next few weeks, the government will likely move the first group of asylum seekers (probably single men from Darwin) to a temporary detention centre on Nauru, thereby opening the Pacific Solution 2.0. Any move by the government to actually transfer people might well spark more protests in Darwin and Christmas Island detention centres as people become more fearful that they too will be sent to Nauru. As we go to press, the High Court is set to hand down a judgement concerning appeal rights for those facing deportation. Already, an Afghan asylum seeker in Villawood, Ismail Mirza Jan, has been told the Immigration department has travel documents for him and is ready to buy his tickets home if the decision goes the government’s way. There are least 20 Tamil asylum seekers in detention who could also be deported straight away, and hundreds more after that. The case of Tamil asylum seeker Dayan Anthony, sent back to Sri Lanka in late July, should leave us in no doubt that the government wants to complement its Pacific Solution with more deportations to show how tough they are on asylum seekers. Under Howard, the refugee campaign grew in the aftermath of the Pacific Solution, fueled by the revelations of the horrors on Nauru and the terrible realities in the mainland detention centres. These factors are at work again. Although the government plans to send a handful of asylum seekers to live in tents and use pit toilets to prove they are serious about Nauru, it will be weeks and months before substanial numbers can be sent there—meaning there is valuable time for the campaign to build awareness and momentum. Gillard’s Pacific Solution is already fraught with problems and contradictions. At the time of writing, there are already enough asylum seekers arrived since the government’s declaration on August 13 that all refugees would now be processed offshore. But neither Nauru nor Manus Island is likely to be properly functional before the beginning of next year. At the rate the boats are arriving in Australia, hundreds of people slated for Nauru will actually be left languishing in Australian detention centres. Just as under Howard, these outrages will build support for the campaign and most likely, protests inside the detention centres. The “no advantage” principle that will mean refugees are in detention for a time similar to the waiting times in Indonesia or Malaysia will mean that the population of long term refugees will grow in detention. The magnitude of the abuses of mandatory detention will grow with it. Under the “no advantage” princple, families and minors will be also be held in detention on Manus and Nauru as well as Australia, exposing the hypocrisy of the Labor government’s commitment to get families and children out of detention. In November 1998, after calls by Amnesty International and the UN Committee on Torture, action by the Transport Workers Union (TWU) at Perth airport prevented the deportation of a Somali asylum seeker. Hundreds of asylum seekers presently face removal. If the High Court decision goes against us, the need for action against removals will become urgent. The movement needs to start now to build up awareness and support among the unions to be in a position to stop deportations as the TWU did in 1998. The comprehensive anti-deportation resolution carried at the recent ACTU conference gives a very good basis for campaigning amongst unions and unionists. A public awareness campaign can also begin now, with actions at airline offices and airports. Thai Airways was the carrier that took Dayan Anthony out of Australia. Thai Airways was an ever-willing carrier of deportees under the Howard government too. Along with that there has to be an education campaign about the situation in Afghanistan and Sri Lanka. Anyone who saw Go Back To Where you Came From will know that Afghanistan is not a safe place; nor is Sri Lanka. The beginning of Pacific Solution 2.0 has outraged and horrified many who were involved in the fight against Howard’s Pacific Solution. Nobody who voted Labor in 2007 thought that only a few years later Labor would be re-opening Nauru and Manus Island. Sydney and Melbourne have rallies planned for October that every activist can get behind building. Sydney’s Refugee Action Coalition has called for a snap protest at the Department of Immigration, the day following the first transfer of asylum seekers from Australia to Nauru. Protest, both on and off Nauru and Manus Island, brought an end to Howard’s Pacific Solution. It can end Gillard’s version too.